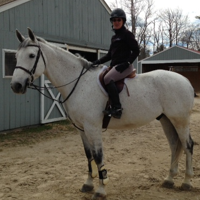 When the winter snows begin to fall, it seems that silver’s shimmer and shine grows stronger than ever. Night comes early now. When you walk to the barn, look up at the sky. You’ll see the stars hanging low in the sky. If only we were tall enough, we could reach up and capture that starlight for ourselves – but instead, we have sterling silver. There is some absolutely great sterling silver horse jewelry in the collection right now. 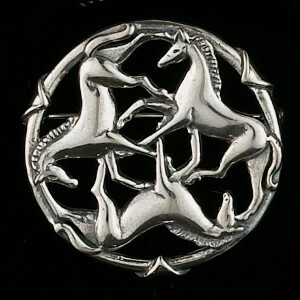 We’re in love with this Celtic Horse Pin. Three horses walk gracefully, their legs intertwined, manes fluttering. It’s a lovely pin for the lapel – a great choice to serve as a signature piece of jewelry. 1 3/8″ in diameter, with classic Celtic styling. A top seller this holiday season (and a perpetual favorite!) 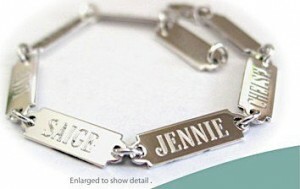 is the Sterling Silver Custom Nameplate Bracelet. There are 8 plates, each of which can be engraved with a name. This is a favorite bracelet of Moms and Coaches! Engraving does take a little time, so if you’re planning to give this bracelet as a gift this holiday season (or a horse locket or any other engraveable horse jewelry!) now is the time to place your order! 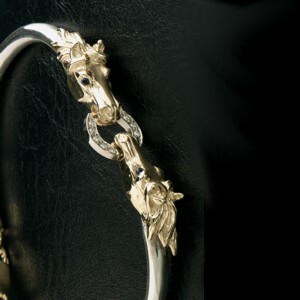 This Snaffle Bit Cuff bracelet from Great Horse Designs is a bold masterpiece. Exquisite American craftsmanship that you can wear with pride. This is a great piece of sterling silver horse jewelry that would have a place of honor in any horse jewelry collection.